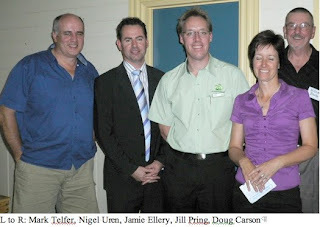 On 2 December 2009, over 100 people attended the DCSCA Public Meeting, Shopping in our community: what could Aldi mean for Drysdale & Clifton Springs? Aldi has applied for permission to build a supermarket in Drysdale's Murradoc Road, which generated a lot of discussion about local shopping options. Jamie Ellery, Manager of Drysdale Safeway, said that the store had 250 employees, mostly locals. He talked about Safeway's efforts to reduce its energy use and to recycle its waste. Nationally, Safeway aims to recycle all its general waste by 2015; and the Drysdale branch wants to link with local farmers to re-use its waste fruit and vegetables. Nigel Uren, Property Manager of Aldi, also stressed his company's 'green' credentials. He gave some background information about Aldi and suggested that Aldi's home brand range complemented other supermarkets' broader range. He outlined what an Aldi supermarket in Drysdale would look like and offer and said that they are awaiting a Council decision on building a store in Drysdale. Finally, Jill Pring and Mark Telfer from Drysdale's Farmers Market group described their 'Harvest Basket' venture - a swap-meet for home grown fruit, vegetables and other produce. The swap-meets happen outside Springdale on the first Saturday of each month and have been well supported. Investigations into starting a Farmers Market continue and the group is learning from Portarlington's 'Port Produce'.